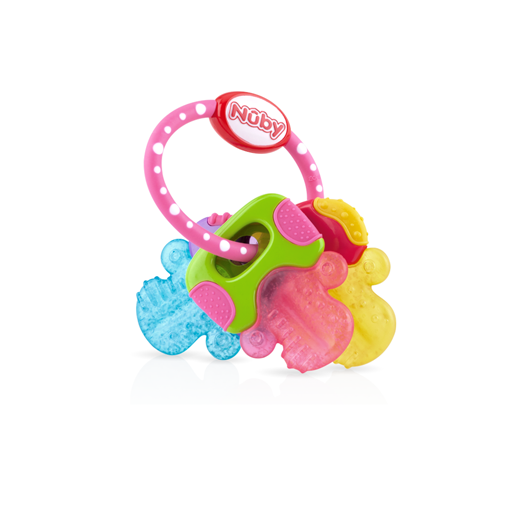 The IcyBite™ Keys teether/soother by Nûby™ is another innovation in the natural teething process; a toy which combines exercises for young hands, gums, and teeth as well as providing visual stimulation for your baby. This colorful toy is also a dual surfaced teether. The tops of the Nûby™ "keys" are constructed of a soft textured material with offset surfaces, that assist in the eruption of teeth through infants delicate gums. For sore gums, the cool resilient bottom part of the "keys" soothes and stimulates safely. Colorful shapes are easy for baby to hold and sized for maximum effectiveness as a teether and soother. 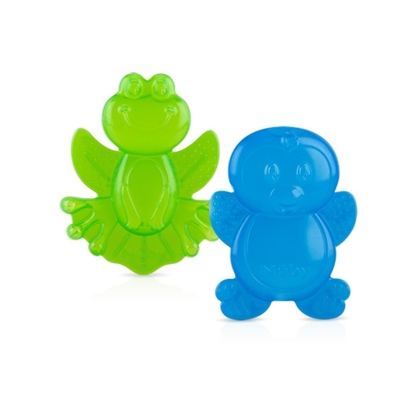 I love this product, I feel good about giving it to my daughter while she is teething. She really seems to like it, and it does sooth her teeth when cold. My only complaint is that the paint on the Nuby symbol seems to wear off.